Is Jay Cutler the next Jeff George? Brian Billick made an interesting comparison today, wondering if Jay Cutler is the next Jeff George. Naturally, bears fans should be terrified by the prospect, though many of them were dumbfounded when the Bears gave him a monster contract extension. The comparison may be appropriate in that both men have great arms along with a gunslinger mentality when playing the position. But that often leads to disaster of course unless you’re Dan Marino or Jim Kelly, and even those guys didn’t win Super Bowls. With Cutler, we’re seeing way too many mistakes, and you have to wonder what’s going on in Chicago. 1. “Tired arm” isn’t the only thing ailing Eli Manning. On Friday NFL Films’ Greg Cosell said that Eli Manning’s struggles the past few weeks were due to the quarterback having a “tired arm.” And after Manning completed 29-of-46 passes for just 215 yards with zero touchdowns and two interceptions in New York’s 31-13 loss to the Bengals, it’s hard to argue with Cosell’s evaluation. Sunday marked Manning’s third straight brutal performance and it’s apparent that he’s lost some zip on his passes. But his problems go beyond declining arm strength, as he’s simply making poor decisions. In his last five starts, Manning has a 2:6 touchdown-to-interception ratio and has averaged just 212.4 yards per game over that span. Granted, his offensive line hasn’t helped him, as Geno Atkins was in his face on both of the interceptions he threw versus Cincinnati. But his play over the past three weeks has been highly concerning and neither he nor the Giants are close to ironing out the problem. Making matters worse, the defense has surrendered at least 23 points since the team’s 26-3 win over the 49ers five weeks ago. Thankfully the Giants are still in first place and they have two weeks to figure out what has gone wrong lately. But it’s clear that they’re a long ways off from being the team that won the Super Bowl back in February. 2. Falcons’ flaws brought to light in loss to Saints. Their record said they were perfect but the Falcons weren’t fooling anybody. This Atlanta team wasn’t the 2009 Colts or the 2009 Saints, and it certainly wasn’t the 2007 Patriots. They were a flawed 8-0 and that was evident in their 31-27 loss to the Saints on Sunday. Unless the defense has been worn out in the fourth quarter, the Falcons haven’t been able to run the ball. Michael Turner is a shell of his former self and the offensive line continues to struggle in short yardage situations. (See the Falcons’ failed third down attempt at the goal line late in the fourth quarter on Sunday.) This team also can’t stop the run. Chris Ivory gashed Atlanta for 10.3 yards per carry (7-72-1) and Mark Ingram had success running between the tackles as well. That opened things up for Drew Brees to find Jimmy Graham, who caught seven passes for 146 yards and two touchdowns as Mike Nolan inexplicably left the New Orleans tight end in one-on-one situations. The good news for the Falcons is that they’re still 8-1. Thanks to Mike Smith they’re fundamentally sound and the Saints game not withstanding, they usually don’t beat themselves. They’re also a more dangerous team with Nolan and Dirk Koetter as coordinators, and maybe the coaching staff will finally realize that Jacquizz Rodgers makes the offense more potent than Turner does. The bad news is that the Falcons still play a red-hot Buccaneers team twice and the Saints have now beaten Atlanta in four of the past five meetings. Barring a historic collapse, the Falcons will make the playoffs and they’ll probably earn one of the top two spots in the NFC. But they need to figure out how to run the ball more efficiently and fix the holes in the run defense if they want to avoid yet another one-and-done in the postseason. Hopefully for the Falcons, this loss will be a blessing in disguise. 3. The Saints still have life. To suggest that New Orleans’ defense played well on Sunday would be a stretch. The Saints surrendered 27 points, 454 total yards, and were just 8-of-16 on third downs. But they also made a ton of plays in crucial moments of their 31-27 win over the Falcons, none bigger than Jabari Greer’s batted pass on 4th-and-goal with the Falcons needing a touchdown to take the lead in the final two minutes. The front seven also stuffed Michael Turner for a 1-yard loss the play before and suffocated Atlanta’s running game throughout the day. The Saints put themselves in a bad hole to start the season but at 4-5 they’re still alive in the NFC, especially with a balanced offense led by Drew Brees. The problem is they may have to go 6-1 the rest of the season in order to get in. With games versus San Francisco, New York, Tampa Bay and Dallas, as well as a rematch with the Falcons in Atlanta, that may not be realistic. But if this defense can stay aggressive under Joe Vitt, you know the offense has the ability to score 30-plus every game. After their victory on Sunday, it’s hard to count the Saints out. 4. The Patriots continue to have issues defensively. When the Patriots held the Rams to just 7 points in London two weeks ago, people believed that New England started to figure things out defensively. But as it turns out, the Rams’ punchless offense had everything to do with the lack of scoring. The Patriots’ defense was gashed in the team’s 37-31 win over the Bills on Sunday. While they did force three key turnovers including a game-sealing pick in the end zone to halt what could have been a game-winning score for Buffalo, New England surrendered 481 total yards, was just 7-of-11 on third downs, and allowed 5.8 yards per rush. What didn’t show up on the stat sheet were the shoddy tackling and the continued reliance on zone coverage. Maybe Aqib Talib will make a difference when he returns from suspension next week, but who knows if he’s even up to speed on Bill Belichick’s scheme after being acquired from Tampa Bay at the trade deadline. Thankfully for the Patriots they’re now 6-0 when they rush for over 100 yards and their offense continues to be a balanced juggernaut. It was a little concerning that Tom Brady and Co. couldn’t deliver that final knockout punch with under three minutes remaining in the game but more times than not, you know the Pats will find a way to score in that situation. Maybe next time they won’t be as fortunate defensively, however. 5. When it’s all said and done, this might be Peyton’s finest season. Coming into Sunday, Peyton Manning was the NFL’s highest-rated passer and had thrown at least three touchdown passes in five straight games. He was on pace for career bests in yards (4,808) and competition percentage (69.5), as well as his second-best touchdown total (40). And that was before he completed 27-of-38 passes for 301 yards with one touchdown and no interceptions in a 36-14 blowout victory over the Panthers on Sunday. Manning has been spectacular – even for him. He’s transformed Denver into a juggernaut offensively, especially in these past six weeks. Over that span, the Broncos are averaging 33.1 points per game and Manning has failed to throw for over 300 yards just once over his last seven starts (a 291-yard effort in a 31-23 win over the Bengals two Sundays ago). With the Chargers fading fast, the Broncos are a near lock to win the AFC West. And given how well Manning has played, it wouldn’t be shocking to see Denver in the AFC title game in a few months. That’s incredible to think about given how many people thought he wouldn’t make it past his first real hit. 6. The two most intriguing teams to watch in the second half? That would be the Colts and the Buccaneers, who have combined to win seven straight games. It’s incredible what Andrew Luck has been able to do in Indianapolis. Outside of Reggie Wayne he doesn’t have many playmakers and his offensive line isn’t very good either. But if the playoffs were to start tomorrow the Colts would own the No. 5 spot in the AFC and Luck would be gearing up for his first playoff start. In Tampa, Greg Schiano has already made his mark with the Bucs. They’ve now won four of their last five games thanks in large part to an offense that has averaged 35.6 points per game over that span, but they can also stop the run and force turnovers defensively. In his first year as a NFL head coach, Schiano has instantly made Tampa Bay tougher, more aggressive, and more potent offensively. His players have bought into his mentality and they’re playing with as much confidence as anyone. But can they make the playoffs? Two of their final seven games come against the Panthers, Eagles and Rams, which are winnable. If they can win those games, they would likely need two victories against the Falcons (whom they play twice), the Broncos, or the Saints. In fact, their playoff hopes may come down to a Week 17 trip to Atlanta, where the Falcons will either be resting starters or trying to secure home field in the playoffs. No matter how the final seven weeks play out, Indy and Tampa are two of the better surprises in the league this season. 7. Young Rams can’t get out of their own way. The Rams made so many mistakes in overtime of their 24-24 tie with the 49ers on Sunday that it’s easy to forget all the blunders they made in regulation. Let’s start with the 13 penalties for 85 yards. Teams usually don’t win when they’re flagged 13 times on the road, no matter who the opponent is. The biggest infraction came on the Rams’ first possession of overtime when they were called for Illegal Formation, which wiped out an 80-yard reception by Danny Amendola. One minute the Rams are at the goal line ready to knock off the first-place 49ers, the next they’re backed up to their own 13 because Brandon Gibson wasn’t on the line of scrimmage. (Isn’t that the first thing on a receiver’s checklist when he breaks the huddle?) Then, of course, there was failure on the coaching staff to call a timeout right before the play clock wound down on Greg Zuerlein’s game-winning 53-yard field goal attempt. Jeff Fisher said following the game that those things happen when you have a rookie kicker, but all it took was either he or someone on his staff to look up and use a timeout when they saw the clock was running down. To essentially blame Zuerlein (who is trying to concentrate on hitting a 53-yarder on the road in overtime, mind you) was ridiculous. There was also Fisher’s questionable decision late the fourth quarter to burn a timeout and persevere enough time for San Francisco to march down the field and kick a game-tying field goal. He understandably wanted to ensure that his staff and his players were all on the same page because the Rams had to score a touchdown in that situation. But it still wasn’t good clock management and it potentially cost the Rams a victory. In the end a tie is better than a loss, especially when you’re a young team playing in a hostile environment and coming off an embarrassing 45-7 loss. But the Rams were ultimately dragged down by their own inexperience. Fisher has also had better days as well. Related Note: There’s absolutely no reason ties should exist in the NFL. For as much money as fans are paying to watch a single game, they shouldn’t leave the stadium feeling like they just kissed their sister. It’s not as if these players have to hit the road and play the following night. This isn’t hockey. If Roger Goodell wants to improve his product both locally and globally, he would take steps to ensure that ties, however rare, should never happen in his league. 8. 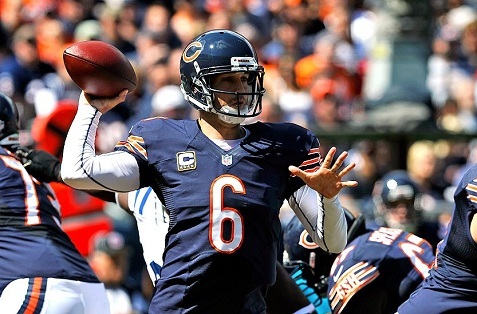 Say what you want about Cutler – the Bears are much better with him healthy. Jay Cutler was brutal before he took a helmet-to-helmet blow from Tim Dobbins late in the first half of the Bears’ 13-6 loss to the Texans last night. But for those that hung in there to watch Jason Campbell’s uninspiring performance, you realized just how important Cutler is to that offense. Cutler can be an arrogant S.O.B. and he deserves the best and the worst of the polarizing debates that he sparks with his antics. But the playoff-bound Bears fell apart last year when both he and Matt Forte went down with injuries and it will happen again if Cutler misses an extended amount of time. Campbell has always been a better player than what people perceive. He’s good a strong arm, can make all of the throws and stands tall in the pocket. But in order for him to win, he needs to have a strong supporting cast and a stable offensive line. Thanks to guys like Forte and Brandon Marshall, he does have enough around him to win. But he won’t survive behind Chicago’s inconsistent O-line. He looked scattered shot last night, constantly looking for the check-down and attempting throws he has no business trying to make. Granted, Houston’s defense will make an opposing quarterback jittery and there’s no question the Bears are better off with Campbell under center than the slop they ran onto the field last year. But it’s a different offense when Cutler is at the controls. And if the Bears are going to make a run at the Super Bowl, they’re going to need their starting quarterback to stay healthy from here on out. 9. The Sanchez contract extension looks even worse now. Back in March the Jets handed Mark Sanchez a five-year, $58.25 million contract extension, which included $20.5 million guaranteed. It was a way for the Jets to apologize to Sanchez for flirting with free agent Peyton Manning, which is just ridiculous. Why the Jets felt the need to apologize to Sanchez is beyond the scope of rational thought. In four years as a starter he’s made marginal improvements and still makes rookie mistakes on a weekly basis. Some like to point out that he led the Jets to back-to-back AFC championship games but it was the team’s defense and running game that led the way. Granted, Sanchez was good in the 2009 and 2010 playoffs but the Jets won in spite of him during the regular season. Without the aid of a power running game and Rex Ryan’s defense, we’ve seen Sanchez’s true capabilities the past two seasons. So again, for the front office to have felt the need to apologize to Sanchez when they were trying to make the team better is laughable. On Sunday the Jets didn’t score an offensive touchdown. They needed a Mo Wilkerson 21-yard fumble return for touchdown in order to avoid being shutout in a 28-7 loss to Seattle. Following the game Ryan told reporters that he’s sticking with Sanchez (9-of-22, 124 yards, 1 INT, 1 lost fumble) despite another brutal effort from his starting quarterback, which makes sense. The Jets already guaranteed Sanchez $20.5 million and it’s not as if Tim Tebow is the future. But if Sanchez is still the team’s starter heading into 2013, then the Jets clearly aren’t in the business to win. After yesterday, there’s really no debate as to who’s the best team in football. The Texans are second in the NFL in total defense behind the Steelers, but I’ll put Wade Phillips’ unit up against anyone else in the league, including Pittsburgh. Houston also has a vicious rushing attack, an offensive line that keeps Matt Schuab upright, and is a team that plays fundamentally sound football…After their lackluster performances over the past few weeks, it was good to see the Ravens come alive on Sunday. Granted, the Raiders have a habit of making everyone look good. But 55 points is 55 points…The fact that the Bengals haven’t given up on the season is a credit to Marvin Lewis and their impressive win over the Giants on Sunday tells you what his players think of him…The Titans are officially the strangest team of 2012. One week they look like an easy win for opponents and the next they’re scoring 37 points on a pretty good Miami defense (not to mention holding the Dolphins to just a field goal after surrendering 51 points to the Bears the previous week)…Speaking of Miami, that playoff talk two weeks ago is nothing but a distant memory now…Stick a fork in the Lions. While Matthew Stafford played his best game of the season in Detroit’s 34-24 loss to the Vikings, his teammates played their worst. Their schedule isn’t favorable the rest of the way and Chicago, Green Bay and Minnesota are just better…Speaking of the Vikings, how funny is Christian Ponder? He’s been a total disaster the past few weeks but you take away his best weapon in Percy Harvin (out with an ankle injury) and he completes 24-of-32 passes for 221 yards with two touchdowns. Go figure…That was a typical Buffalo Bills loss on Sunday and for those that saw it, no explanation is necessary…No quarterback has turned the ball over more since 2011 than Philip Rivers, who has coughed it up 40 times in less than two years. His interception to Leonard Johnson was easily one of the worst decisions you’ll see a NFL quarterback make, nevertheless one that was a top 5 pick…Very quietly the Seattle Seahawks have just as many wins as the San Francisco 49ers…In looking at the Cowboys’ schedule, they could easily rattle off five straight following their 38-23 win in Philadelphia on Sunday. If they can manage to stay out of their own way, that is. Monday Night Football Prediction: Steelers beat the hapless Chiefs, who somehow figure out a way to cover the 12.5-point spread. Will Jay Cutler grow up? The quarterback drives everything these days in the NFL. You need someone with talent, but you also need a leader. When fans and betting pros are researching picks for the weekend games, checking out the lines and researching the sports betting reviews, the biggest factor in the spread and who will win centers around a quarterback. Some people are taking this analysis to an extreme by totally downplaying the running game and defense, but the quarterback is still critical to any NFL game outcome. Which brings us to Jay Cutler, a quarterback with a ton of talent who seems to have a ten cent head. He’s cocky, but he’s very inconsistent. He’s taken a beating in the pocket, so he’s shown to have toughness, yet you really never know which Jay Cutler is going to show up. And last week we saw his embarrassing tantrum against his left tackle. Now Cutler isn’t the first diva quarterback to behave this way, and he certainly won’t be the last, but with all the problems he has with his own game, a bit of humble pie would do him some good. He has to be a leader and hold his teammates accountable, but how he does this is equally important. Let’s see if he learns his lesson after this episode.